Digital technologies have moved from being a peripheral innovation to being part of the core services we offer learners. Today’s learners have grown up in a world of computers and the Internet and see such technologies as a key part of their learning toolset (Sharpe and Beetham 2010). Digital technologies enable learners to engage with rich multimedia, and social and participatory media enable learners to communicate and collaborate in a variety of different ways. Smart phones and tablets mean that mobile learning, anywhere, anytime is now a reality. Virtual worlds and gamification facilitate authentic learning and role play (Wills, Leight et al. 2010; Childs and Peachey 2011; Childs and Peachey 2013). This chapter will provide an overview of the key technological developments over the past thirty years and will critique their impact on formal and informal learning. It will conclude with a projection of future scenarios for education and emergent technological trends. Information and communications technologies (ICT) enable new ways of producing, searching and sharing information and knowledge (Conole 2013). As the amount of information is rapidly increasing, it has become even more important to manage complex entities and to recognize relevant and reliable information and knowledge. A UNESCO report from 2005 lists seven ways that technologies can be used in education. Firstly, it can improve administrative efficiency and provide a pan-institutional IT infrastructure for managing the different aspects of learning, teaching and research. Secondly, ICT can be used to disseminate teaching and learning materials to teachers and students, usually through an institutionally supported Virtual Learning Environment (VLE)/Learning Management System (LMS). In addition, many institutions now have Learning Object or Open Educational Resource repositories. Similarly, most institutions have an open access research repository and increasingly academics are required to deposit their research outputs in the institutional research repository. These are also increasingly being used in terms of research accountability, both for internal promotion and in terms of returns for national research assessment exercises. Thirdly, they can be used to improve the ICT skills of teachers and students and their digital literacies and competences (Jenkins 2006; Jenkins 2009). Most institutions have a range of online resources to help teachers and students develop their digital literacy skills and for students to develop good practices in terms of study skills. Resources are also usually available to help teachers make effective use of technologies in the design of courses. Fourthly, they allow teachers and students access to sources of information from around the world. Increasingly, teachers and students are augmenting institutional IT systems and resources, with tools and resources freely available on the web. Increasing use is being made of cloud computing technologies for example (Katz 2008). Some institutions have outsourced core tools like email and many are moving to tools like Google Apps for example to provide tools for communication and sharing of resources. Many students now prefer to have IT tools that they can use post-course, and do not want to be tied into institutional email systems for example. Fifthly, academics want examples of good practice and mechanisms for sharing ideas on education and learning. IT systems can enable this in two ways: through repositories of learning materials and designs, and by providing mechanisms for academics to share and discuss learning and teaching. Sixthly, IT systems can provide spaces for academics and students to collaborate on joint projects. These can also be used to support collaboration for research projects. Finally, IT can be used to conduct lessons from remote locations and support distance learning. This can include both synchronous and asynchronous communication. A JISC report (JISC 2011) states that digital technologies are changing the way researchers work and the way in which research is conducted. EDUCAUSE provide an authoritative overview of emergent technologies of relevance to educational institutions, with their ‘7 things you should know about…’ series of reports. Krishnaveni and J.Meenakumari (2010) argue that computers can be used extensively for educational administration. They list the following as some of the areas where computers can be used for effective educational administration: general administration, pay roll and financial accounting, administration of student data, inventory management, personnel records maintenance and the library system. They suggest ICT can support three areas of activity: student administration, staff administration and general administration. Student administration involves various activities from the admission process to learning activities through to the processing of results and performance analysis. Important aspects include the automation of admission process through e-media (including dealing with initial student enquiries, applying for admissions through electronic media, registration, electronic enrolment, course allocation, and information about timetable and attendance monitoring. This also includes communication with peers and tutors. Staff administration includes recruitment and work assignment, recoding attendance, leave management and performance appraisal. The following are the core IT services that educational institutions offer: i) support services, which includes a help desk and desktop computing, user support, training, computer store, ii) educational technology services, which includes support for student technology (laboratories, training, support, etc. ), support for academics in terms of instructional technology and in particular support on using the institutional LMS, classroom and learning space support, multimedia services and support for distance education provision. There are also a range of IT services around the administration of IT organisation, IT planning and budgeting, IT policy, IT security, project management, business process analysis, systems analysis, enterprise Infrastructure and Services; Identity Management Information Systems for finance, Human Resources, students, alumni and fundraising, facilities, grants management, etc., business intelligence/data administration/data warehouse. It also covers communications infrastructure services, such as: network infrastructure and services, telephony, data centre operations, research computing and web support services. Institutions will have a general website about the university, with each department having a web presence containing information about their courses and research activities. Figure 1 shows the e-learning timeline that the chapter is based on. The chapter will discuss each of the key technological developments that have arisen over the past thirty years or so and will critique their implications for formal and informal learning. The starting point, in terms of significant technological developments that have had an impact on education, is the emergence of tools for creating rich multimedia in the late eighties. These included tools such as Authorware Professional, Toolbook and Macromedia. Initially these were used to create content on CD ROMs, but when the Web and suitable browsers emerged they shifted to being made available via the Web. Text could be combined with images, audio and video, along with interactive formative e-assessment exercises. Another important feature was the ability to create non-linear text through hypertext. As Ingram notes (Ingram 2000) hypertext enables new forms of scholarly discourse. A significant milestone was the emergence of the Web in the early nineties. Institutions began to create institutional Web pages, along with departmental sites on their courses. Today it is given as a norm that every institution will have a significant Web presence and students looking for courses will browse institutional Websites in order to make informed decisions on which institutions and courses they want to apply for. In addition, email became the primary means of communication. At about the same time institutions began to provide academics with their own computers and subtle changes in practice began to emerge, such as the demise of the traditional role of secretaries as academics shifted to writing their own content. The roles of librarians also changed to being digital curators. Harle (2008) states that ‘A transformed higher education environment, which depends increasingly on the internet to deliver programmes and to access and disseminate scholarly information, has presented libraries with many challenges. And in a recent article in the Guardian newspaper, it was argued that ‘Far from reaching its due-by date, academic library architecture is reflecting and predicting how we learn now and into the future. Finally, new professional service roles emerged such as educational technologists and learning designers (Beetham 2001). 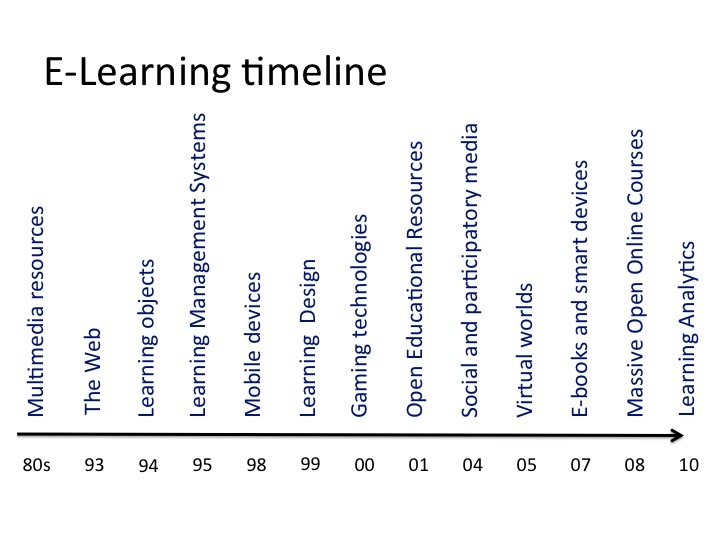 The concept of ‘Learning Objects’ emerged into the wider world in around 1994. The central idea was that rather than create 100 first-year Economics courses, that one course could be created, shared and adapted, in other words creating an Educational digital market place (Littlejohn 2003; Wiley 2005; Lockyer, Bennett et al. 2008). A key aspiration was the notion of not invented here syndrome and enabling academics to work collectively to produce resources. Although the vision associated with Learning Objects was not realised, essentially they were precursors to the Open Educational Resource (OER) movement. 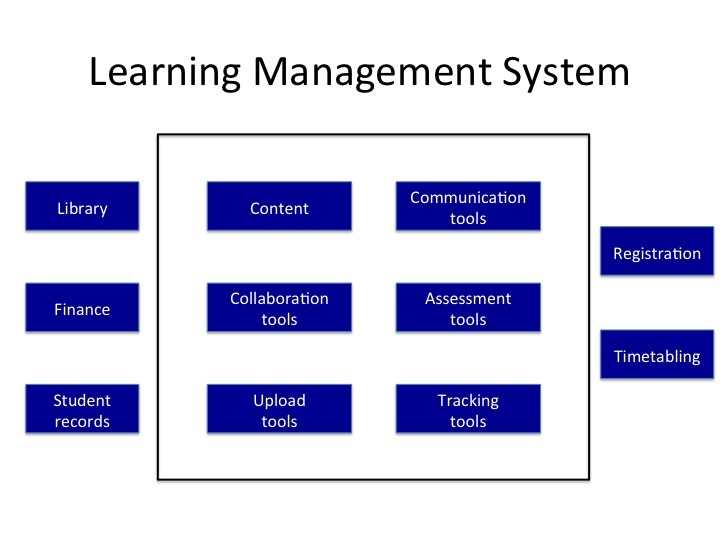 Learning Management Systems (LMSs) emerged in 1995. They were significant in two respects. Firstly, institutions began to realise that technologies were no longer peripheral innovations, but were part of the core service offered to students. They set up committees to evaluate and implement institutions LMSs and put in place support mechanisms to help academics use them effectively. Today, LMSs are offered in virtually all educational institutions, as a space to upload course content and provide communication, collaboration and assessment tools to support course delivery. Secondly, they provided academics with a safe nursery slope to experiment with putting content online and enabling them to use the LMS tools to support the learning process and communicate with their students. More recently, we have seen the emergence of Learning Analytics as a research field, which is concerned with harnessing the data underneath LMSs to better understand patterns of learning behaviours. Institutions used LMSs as a means of managing the delivery of courses. Figure 2 shows the typical components of an LMS and the relationship to other institutional IT systems. Three of the most popular LMSs are Blackboard, Moodle and Sakai. LMSs provide a hub for learning materials and course delivery and often also cover the management of course registration, course scheduling, discussion forums, blog sites, student scores, and student transcripts. LMSs contain a number of tools for presenting learning materials, for communication and collaboration and for managing assignments. These include tools such as blogs, wikis and e-portfolios. For most institutions the LMS is the most significant enterprise level application for learning and teaching. JISC provide a list of the main functionality associated with an LMS. These include: controlled access, via a password to the courses that the student is taking. Also student tracking in terms of what materials they are access and how long they are spending on them. Learning Analytics has emerged as a new research field in recent years (Siemens, 2010). Tools and dashboards are being developed to harvest the data available from LMSs in terms of what the students are doing. These tools potentially can be used by academics to monitor student progress and identify students who are having difficulties and also by students themselves in terms of monitoring their own progress. The LMS records system has basic information about students, such as: registration details, course details, course prerequisites, qualification aims, study time and tracking information. LMSs are also used as repositories for learning resources and materials. These might be produced by the course designer, may be commercial materials or freely available Open Educational Resources (OER). Materials can be presented in a variety of format from simple text to interactive multimedia. There are also a number of tools to support the students in their learning, these include: assessment tools (both e-submission systems for assignments as well as e-assessment tools), and tools for communication and collaboration A range of tools are provided to support interactions between students and between students and their tutors. There are three basic methods of communication tools common in LMSs: email, discussion forums and chat rooms. Tools may also be included to enable students to publish materials either via an uploading facility, through a blog or a wiki. Within the LMS it is possible to link to other web-based resources, such as other sites of relevance in the institutions, for example library resources and links, as well as external links. A JISC CETIS report provides a good overview of Learning Management Systems. The report describes the status of LMSs and their relationship to cloud computing. It also describes a number of different models of Distributed Learning Environments. What is new in ‘mobile learning’ comes from the possibilities opened up by portable, lightweight devices that are sometimes small enough to fit in a pocket or in the palm of one’s hand. Typical examples are mobile phones (also called cellphones or handphones), smartphones, palmtops and handheld computers (Personal Digital Assistant or PDAs), Tablet PCs, laptop computers and personal media players can also fall within its scope. A number of projects explored the use of such devices across formal and informal learning contexts; considering how these devices could be used across different learning spaces, beyond the formal classroom setting, into the home and within informal learning contexts, such as museums. Learning Design emerged as a research field at the end of the nineties, as a counter measure to the most established field of Instructional Design(Reigeluth and Carr-chellman 2009). Driven primarily by researchers in Europe and Australia, Learning Design aimed to provide practitioners with guidance and support to inform their design process which is pedagogically effective and makes appropriate use of technologies. It is seen as a more encompassing term than Instructional Design, which operates primarily at the level of multimedia; in contrast Learning Design provides a holistic approach to the design process. There are three facets to it: guidance, visualisation and sharing. Conole (2013) provides an overview of the field, also see the Larnaca Declaration on Learning Design. The potential of gamification, however, goes beyond promoting healthy lifestyles and marketing strategies. Gamers voluntarily invest countless hours in developing their problem-solving skills within the context of games (Gee, 2008). They recognize the value of extended practice, and develop personal qualities such as persistence, creativity, and resilience through extended play (McGonigal, 2011). Gamification attempts to harness the motivational power of games and apply it to real-world problems – such as, in our case, the motivational problems of schools. Gee describes the concept of ‘situated and embodied learning’ that is at the core of game-based learning; i.e. meaning a student is not just being taught inert knowledge, rather using facts and information as tools for problem solving in a specific context and solving the problem (Gee 2011). The Open Educational Resource (OER) movement emerged in 2002, promoted by organisations such as UNESCO and the William and Flora Hewlett Foundation. UNESCO argues that Education is a fundamental human right and therefore educational resources should be freely available. The term Open Educational Resources (OER) was first used by UNESCO at its ‘Forum on the Impact of Open Courseware for Higher Education in Developing Countries’ in 2002. Alternative labels include ‘open courseware’, ‘open learning resources’, and ‘open teaching/learning resources’ (UNESCO 2002). Teaching, learning, and research resources that reside in the public domain or have been released under an intellectual property license that permits their free use or re-purposing by others. Digitised materials offered freely and openly for educators, students and self- learners to use and reuse for teaching, learning and research (OECD, 2007, p. 133). Commission by the Hewlett foundation, Atkins et al. (2007) provide a comprehensive review of the development of the OER movement, describing many of the major initiatives in the fields and some of the key achievements. A complementary report emerged at around the same time, commissioned by OECD (2007). Both reports give a good overview of the field, the motivations and aspirations behind the OER movement, as well as a reflection on some of the challenges associated with this area. In 2002, Hewlett initiated an extensive OER programme, the chief aim was to “catalyze universal access to and use of high-quality academic content on a global scale” (Atkins et al., 2007, p. 1). In the UK, the Higher Education Academy (HEA) and the Joint Information Systems Committee (JISC) initiated a large-scale call on the development of OER, building on existing initiatives such as JORUM and OpenLearn. The belief that everyone should have the freedom to use, customize, improve and redistribute educational resources without constraint. It focuses on three suggested strategies to removing barriers to the use of OER: teacher and learner engagement with OER, a general policy to publish openly, and a commitment to open approaches at institutional and government levels. The OER movement has been successful in promoting the idea that knowledge is a public good, expanding the aspirations of organisations and individuals to publish OER. However as yet the potential of OER to transform practice has not being realised, there is a need for innovative forms of support on the creation and evaluation of OER, as well as an evolving empirical evidence-base about the effectiveness of OER. However, recognition of the importance of investment and effort into promotion of the use and uptake of OER is evident in the prominence given to OER developments in a major report on cyberlearning, commissioned by the National Science Foundation (2008). Interestingly, “adopt programs and policies to promote Open Educational Resources” is one of the five higher-level recommendations in the conclusion to the report. • Media sharing – creation and exchange of media with peers. • Media manipulation and data/Web mash ups – tools to design and edit digital media files and combine data from multiple sources to create a new application, tool or service. • Instant messaging, chat and conversational areas – to enable one-to-one or one-many conversations. • Online games and virtual worlds – rule-governed games or themed environments. • Social networking – enabling social interactions between friends and peers. • Blogging – where users can post text that others can comment on. • Social bookmarking – aggregation and tagging of Web resources. • Recommender systems – that aggregate and tag user preferences and make recommendations. • Wikis and collaborative editing tools – where users can collaboratively create, edit and link pages. • Syndication – where users can subscribe to RSS feed-enabled Websites. • A shift from the Web as a content repository and information mechanism to a Web that enables more social mediation and user generation of content. • New practices of sharing (such as the use of Flickr for images, YouTube for videos, and SlideShare for presentations) and mechanisms for content production, communication and collaboration (through blogs, wikis and micro-blogging services such as Twitter). Social networking sites provide a mechanism for connecting people and supporting different communities of practice (such as Facebook, Elgg and Ning). • A scale or ‘network effect’ is emerging as a result of the quantity of information available on the Web; the multiplicity of connectivity and the scale of user participation, and as a result new possibilities for sharing and harnessing these ‘network effects’ is occurring. • Peer critiquing – the ability to openly comment on other people’s work. This has become standard practice within the blogosphere and is being used in general society. For example a growing number of authors and journalists are now active bloggers and traditional book writing is being supplemented by writers keeping a blog and inviting readers to comment on the evolving plot, by academics (through self-reflective blogs on digital scholarship and research ideas) (Weller 2011) and by learners (in terms of keeping their own reflective blogs or contributing to a collective cohort blog). • User-generated content – there are now many different tools for creating content (ranging from those which are primarily text-based, through to rich multimedia and interactive tools), meaning that the Web is no longer a passive medium for consumption, but an active, participatory, productive media. Sites such as YouTube, Flickr and Slideshare facilitate sharing of user-generated content and the embedded code functionality means that content can be simultaneously distributed via a range of communication channels. • Collective aggregation - hierarchy and controlled structures make little sense in an environment that consists of a constantly expanding body of content that can be connected in a multitude of ways. Collective aggregation refers both to the ways in which individuals can collate and order content to suit their individual needs and personal preferences, as well as the ways individual content can be enriched collectively by the wider community (via tagging, multiple distribution, etc.). Social bookmarking, tag clouds and associated visualisation tools, tagging, RSS feeds and embedding code all enable collective aggregation to occur. • Community formation – clearly the connectivity and rich communicative channels now available on the Web provides an environment for supporting a rich diversity of digital communities. Boundaries of professional and personal identity are eroding and the notion of tightly knit Communities of Practice (Wenger 1998) are giving way to a spectrum of communities from individualistic spaces through loosely bound and often transitory collectives, through to more established and clearly defined communities. See Dron and Anderson (2007) for a more specific discussion of collectives, networks and groups in social networking for e-learning. • Digital personas – individuals need to define their digital identity and how they ‘present’ themselves across these spaces (Solove 2004). The avatars we choose to represent ourselves, the style of language we use and the degree to which we are open (both professionally and personally) within these spaces, give a collective picture of how we are viewed by others. There was great excitement about the potential of virtual worlds (such as Secondlife) in 2005 and in particular the ways in which they could be used to facilitate authentic learning and role-based learning. Users create an avatar, which can move around the online virtual space, interacting with others and creating objects. There are numerous examples of role-based learning in Virtual Worlds, to create spaces for subjects such as Archaeology, Medicine, Language learning and law. The SWIFT project, undertaken at the University of Leicester, created a virtual Genetics laboratory to teach students the basic rules of interacting in a laboratory and to enable them to undertake measurements and collect data using virtual instruments. An advantage of the virtual space is that ‘experiments’ can be augmented with multimedia presentations showing the students what is happening at a molecular level. Virtual worlds are interactive computer-based environments that can be accessed by many people simultaneously through the internet. Each participant in the virtual world is represented by an avatar, a human-looking representation of him or herself. Other participants also appear as avatars in the virtual world. Avatars can explore the 3D space together in real time. Avatars can, for example, walk around buildings, talk to each other and interact with machinery and other objects. The world is persistent, and continues to exist and change whether an individual avatar is present or not. He goes on to list the following benefits of Virtual Worlds: simulation, physical representations of logical constructs, mediated environment, role playing and creativity. However, despite the initial enthusiasm for Virtual Worlds they are not being used extensively. Part of the problem is in the fact that the current Virtual Worlds are still difficult to use and part of the problem is that there are not many learning interventions where other others of technologies can be just as appropriate, i.e. it is not clear that the investment in time in building and using the Virtual World is worth it. A second generation of mobile devices emerged in 2007, i.e. e-books and smart devices. Smart phones, such as the iPhone and numerous Android phones, have gained considerable popularity and we have seen the emergence of a range of tablet devices, such as the Kindle, iPad, Microsoft’s Surface and the Nexus tablet. Numerous Apps have been developed for these devices, many specifically for use in an educational context. There are also Apps for popular sites, such as Facebook, YouTube, Twitter and Flickr. Many institutions are now creating mobile-friendly interfaces for their institutional Learning Management systems. There are also tools for creating content on mobile devices, such as iBook Author for creating content on iPads and iPad minis. The following materials and tools available on mobile devices are particularly useful for learning: study calendars (to provide learners with an outline of what they need to do by when and indications of assignment deadlines), To Do lists (to enabled learners to map out their study approach and what they need to do by when), e-books and pdfs (which can be annotated and bookmarked), interactive learning materials (consisting of text, images, audio and videos and may also contain formative e-assessment), online modules associated with formal educational courses, annotation tools, mind mapping tools and a range of communication and collaboration tools. The course App is easily accessed, it is pre-structured and organized. I find it a logical progression and a great guide to complete a unit by using the course App. If it was not available I would use the blackboard [the institution’s LMS] as opposed to print, again as it is easier to access view. I travel quite a lot for work making the use of iPad ideal. The Application is the best to use. Except for the need for wifi or interaction connection: PLEASE download everything to the app: we are not allowed to have wifi and it is very difficult to access youtube etc. in here. The Medical school has given all their first-year students iPads and Archaeology are using tablets for fieldwork to enable students to collect data in the field. The term Massive Open Online Courses (MOOCs) was first defined in 2008 to describe the Connectivism and Connected Knowledge course developed by George Siemens and others. This was designed using the connectivist pedagogy developed by Siemens (Siemens 2005). Connectivism emphasises the power of learning through a large-scaled, distributed community of peers. There is no formal learning pathway, each learner creates their own Personal Learning Environment, with a mixture of tools to curate resources, and to communicate and collaborate with others. It relied on the benefits of scale though significant interaction with a distributed network of peers. Participants were encouraged to use a variety of technologies; to reflect on their learning and to interact with others. There was no ‘right way’ through the course; the emphasis is on personalised learning through a Personal Learning Environment. Variants on this course emerged, collectively known as cMOOCs, examples included: David Wiley’s course on ‘Open Education’, ‘Personal Learning Environments and Networks (CCK11)’, and ‘Learning Analytics (LAK12)’. This type of MOOC has been described as a cMOOC. Dave Cormier provides a useful summary of this type of MOOC. A massive open online course (MOOC) is an online course aimed at large-scale interactive participation and open access via the web. In addition to traditional course materials such as videos, readings, and problem sets, MOOCs provide interactive user forums that help build a community for the students, professors, and TAs (Teaching Assistants) (Wikipedia 2012). The acronym highlights the key components; i.e. that they are online courses which harness the potential for learning in a large-scale, distributed community of peers, through open practices. Much has been written about the emergence of MOOCs as a phenomenon, these are not listed here, but for an up to date account of MOOC research, there are two recent special issues on current research in the field, and a special issue of Distance Education. A second type of MOOC emerged in 2011, namely xMOOCs. These were primarily based on interactive media, such as lectures, videos and text. xMOOCs adopted a more behaviourist pedagogical approach, with the emphasis on individual learning, rather than learning through peers. As a result a number of companies emerged, such as: Udacity, EdX, and Coursera. These courses tend to be offered by prestigious institutions, such as Harvard and Stanford; the emphasis is on delivery of content via professors from these institutions. Nkuyubwatsi provides a useful overview of MOOCs, including a review of some of the key courses from 2008 (Nkuyubwatsi 2013). He discusses the key controversy around MOOCs, stating that MOOCs are hailed for their fit within a knowledge society, providing each learner with opportunities to engage with material via formative assessments and the ability to personalise their learning environment. However, he goes on to state that they are criticised for the lack of constructive feedback and the lack of creative and original thinking, citing Bates (2012) and low completion rates, citing Daniel (2012). The plethora of MOOCs now available, in a variety of languages (although the majority are still in English), is staggering. Recent examples include: the announcement in the UK of FutureLearn (with 29 institutions), Open2Study from the Open University of Australia and the EU-based OpenUpEd. I would argue that the classification of MOOCs as either xMOOCs or cMOOCs is too limiting and have proposed an alternative classification, based on 12 dimensions: the degree of openness, the scale of participation, the degree of their use of multimedia, the amount of communication, the extent to which collaboration is included, the type of learner pathway (from learner-centred to teacher-centred and highly structured), the level of quality assurance, the extent to which reflection is encouraged, the level of assessment, how informal or formal it is, the degree of autonomy possible, and the diversity of the learner population. The discourse on MOOCs is contested; some seem them as an example of disruptive technology,(Christensen 1997) others are more sceptical about their value. The benefits sited include: the fact that they are free, that they enable participants to experience being part of a global, enabling learner to be part of a distributed community of peers and as a means of overcoming social exclusion. The disadvantages include the fact that many see them merely as a marketing exercise, the high drop-out rates and that the focus is more on learning income than learning outcome. Nevertheless they continue to be debated and more and more institutions are experimenting with them as a marketing innovation, a pedagogical innovation, and a form of shop window onto more formal educational offerings. Tools are being developed to harvest the data available from LMSs in terms of what the students are doing, which can then be displayed via dashboards. These tools can be used by academics to monitor student progress and identify students who are having difficulties and also by students themselves in terms of monitoring their progress and improving their study behaviour. The LMS records system has basic information about students, such as: registration details, course details, course prerequisites, qualification aims, study time and tracking information. An important future direction will be making a closer connection between Learning Design and Learning Analytics, whereby Learning Analytics provides us with an indication of how learning has taken place, which can inform better and more effective Learning Design. The benefits of Learning Analytics include: that fact that it can as a tool to understand learning behaviour, it can provide evidence to support design of more effective learning environments, and it can be used to make more effective use of social and participatory media. This chapter has provided a review of the key technological developments that have occurred in the last thirty years are so and has considered the implications for learning. We cannot predict the future, but it is evident that technologies will continue to evolve and will have an ever increasing impact on our lives. Although we cannot predict the future, we may see glimpses of it through reports like the New Media Consortium’s annual Horizon report and the annual innovating pedagogy report produced by the OU UK. The 2014 Horizon report for Higher Education lists the following technological and pedagogical trends: online, hybrid and collaborative learning, and social media use in learning (one year timeframe), the creator society and data-driven learning and assessment (three year timeframe) and agile approaches to change and making online learning natural (five year timeframe). The 2013 Innovating Pedagogy report lists the following ten technologies which are likely to have an impact in the near future: MOOCs, badges to accredit learning, Learning Analytics, seamless learning, crowd learning, digital scholarship, geo-learning, learning from gaming, maker culture and citizen inquiry. To conclude, it is worth reflecting on why e-learning is important. I think there are two main reasons. Firstly, in the role technologies can play in terms of improving learning and student engagement, for example in the potential technologies have to support interaction, communication and collaboration. Also in the way in which they can help learners develop their digital literacy skills. They can also be used to promote different pedagogical approaches and provide mechanisms to foster creativity and innovation, and to encourage critical thinking skills. They provide a mechanism for connecting students beyond the formal course. Secondly, more broadly in terms of preparing students for an uncertain future, where they are likely to change careers more than once and where we are training them to do jobs that do not even exist at the moment. Also effective use of and competence with technologies improves students’ employability opportunities. And finally, in terms of equipping our students to become digital citizens, ready to tackle a world in which technologies are ever increasingly pervasive. To conclude, the nature of learning, teaching and research is changing as a result of the increasing impact of technologies in education. We are seeing changing roles and evolving organisation structures. In addition, disruptive technologies, like MOOCs, are challenging traditional educational business models and new models are emerging. We need to think beyond the distinction of campus-based and online learning, to focus more on the notion of Technology-Enhanced learning spaces. We cannot as individuals or institutions afford to ignore technologies, we need to harness the characteristics of new media and adopt more open practices in our learning, teaching and research. Thanks to Dr Martyn Cooper for providing comments on a draft of this chapter. Atkins, D. E., J. S. Brown, et al. (2007). “A review of the open educational resources (OER) movement: Achievements, challenges, and new opportunities.” Report to The William and Flora Hewlett Foundation. Bates, T. (2012). What’s wrong and right about Coursera-style MOOCs, . 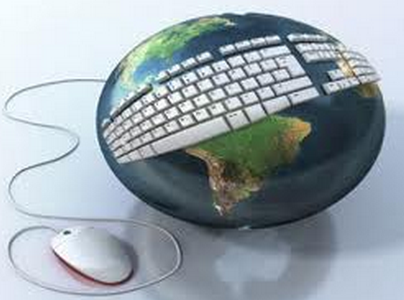 Online learning and distance education resources. Bird, T. (2013). Mobile learning in the 21st Century: Leicester and beyond, Powerpoint presentation, 5th December 2013, available online at http://www.slideshare.net/tbirdcymru/. Childs, M. and A. Peachey (2011). Reinventing ourselves: contemporary concepts of indentity in Virtual Worlds. New York, Springer. Childs, M. and A. Peachey (2013). Understanding learning in Virtual Worlds. London, Springer. Conole, G. and P. Alevizou (2010) Review of the use(s) of Web 2.0 in Higher Education. Crook, C., J. Cummings, et al. (2008). Web 2.0 technologies for learning: the current landscape - opportunities, challenges and tensions, a BECTA report. Daniel, J. (2012). “Making sense of MOOCs: Musing in a mazr of myth, paradox and possibility.” Journal of Interactive Media in Education 18. Gee, J. P. (2011). “Games and Education Scholar James Paul Gee on Video Games, Learning and Literacy.” from http://www.youtube.com/watch?v=LNfPdaKYOPI , last accessed 14/1/14. Harle, J. (2008). Commonwealth libraries: changing roles and new opportunities, report for the Association of Commonwealth Universities. Ingram, B. (2000). “Scholarly rhetoric in digital media (oe: now that we have the technology, what do we do with it? ).” Journal of Interactive Media in Education 3. Jenkins, H. (2006). Convergence culture: Where old and new media collide, NYU Press. JISC (2011). Support research with advanced digital technologies - an approach for institutiions, available online at http://www.jisc.ac.uk/media/documents/publications/briefingpaper/2011/bpsupportingresearchers.pdf, accessed 20th September 2012. Katz, R. (2008). The tower and the cloud: Higher Education in the age of cloud computing, an Educause ebook. Krishnavemi, R. and J. Meenakumari (2010). “Usage of ICT for Information Administration in Higher education Institutions – A study.” Journal of Environmental Science and Development 1(3). Kukulska-Hulme, A. and J. Traxler (2005). Mobile learning - a handbook for educators and trainers. Abingdon, Routledge. Littlejohn, A. (2003). Reusing online resources: a sustainable approach to e-learning, RoutledgeFalmer. Lockyer, L., S. Bennett, et al. (2008). Handbook of Research on Learning Design and Learning Objects: Issues, Applications and Technologies, IGI Global %@ 1599048612 %7 illustrated edition. Nkuyubwatsi, B. (2013). The evaluation of Massive Open Online Course (MOOCs) from the learner’s perspective. ECTEL, Paphos, Cyprus. O’Reilly, T. (2005). What is Web 2.0 - Design patterns and business models for the next generation of software. OECD (2007). Giving knowledge for free – the emergence of open educational resources, Centre for educational research and innovation, report for OECD. Reigeluth, C. M. and A. A. Carr-chellman (2009). Instructional-Design Theories and Models, Volume III, Routledge %@ 0805864563 %7 1. Sharpe, R. and H. Beetham (2010). Rethinking learning for the digital age: how learnes shape their own experiences. London, Routledge. Sharples, M., D. Corlett, et al. (2002). “The design and implementation of a mobile learning resource.” Personal and ubiquitous computing 6: 220-234. Siemens, G. (2005). “Connectivism: A learning theory for the digital age.” International journal of instructional technology and distance learning 2(1): 3–10. Siemens, G. (2010). What are learning analytics. ELearning space: learning, networks, knowledge, technology, community. Solove, D. J. (2004). The digital person - technology and privacy in the information age. New York, New University Press. Wikipedia (2012). “Massive Open Online Courses.” from http://en.wikipedia.org/wiki/Massive_open_online_course. Wiley, D. (2005). Learning objects in public and Higher Education. Innovations in instructional technology. J. M. Spector, C. Ohrazda, A. V. Schaack and D. A. Wiley. Mahwah, NJ, Lawrenc Erlbaum Associates. Wills, S., E. Leight, et al. (2010). The power of role-based e-learning. London, Routledge. We mean classrooms in the broadest sense – also including lecture halls, seminar/tutorial rooms, laboratories, fieldwork contexts and online. A mashup is a Web page or application that uses and combines data, presentation or functionality from two or more sources to create new services. This entry was posted on Wednesday, January 15th, 2014 at 1:46 pm	and is filed under General. You can follow any responses to this entry through the RSS 2.0 feed. You can leave a response, or trackback from your own site. Childs, M. and A. Peachey (2011). Reinventing ourselves: contemporary concepts of indentity in Virtual Worlds. New York, Springer. is actually Peachey, A. and M. Childs (2011). Reinventing ourselves: contemporary concepts of indentity in Virtual Worlds. New York, Springer. and another go at getting the reference right: Peachey, A. and M. Childs (2011). Reinventing ourselves: contemporary concepts of identity in Virtual Worlds. UK: London, Springer. not invented year => not invented here ? You can flush this comment. Very good timeline history of e-learning. I’ve found the section about social medias and Web 2.0 particularly informative. The subject is very vast and it’s normal to missed some subjects. I would like to find a section on programmed learning and maybe Intelligent tutoring Systems (ITS). Technically inclined… may I suggest to draw parallels between the innovation in e-learning and technological evolution in the outside world. For instance, MOOCs are the direct product of cloud computing and Learning Analytics benefit from the huge amount of data collected on the Internet and the Big Data / Machine Learning technologies.